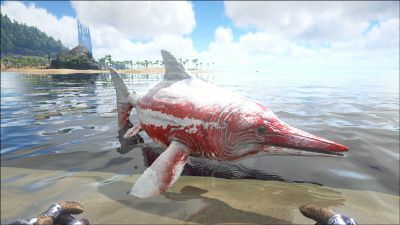 The Ichthyosaurus (ick-thee-oh-sawr-us) or Ichthy is one of the creatures in ARK: Survival Evolved. Ichthyosaurus curiosa is a comparatively small carnivore found in the waters around the island. It is slightly larger than a human, but that’s still small compared to the leviathans roaming these waters. It seems to be very interested in any creature around its size, often approaching and following humans swimming through its waters. Despite its appearance, the Ichthyosaurus is neither a fish nor an ocean mammal. Like many creatures in the waters around the island, it is actually an aquatic reptile. I can’t think of a better mount for someone starting to explore the island’s seas and waterways. Ichthyosaurus is comparatively fast swimmer, and even in the wild will cozy right up to you and try to figure out what you’re doing. Taming these is actually pretty easy, as they seem to love humans and will be fed and tamed without the use of violence. Ichthyosaurs are a very friendly species to most creatures, and will often swim towards you and around you out of curiosity. They will push you ashore if you run out of stamina and can't surface for oxygen in time. They act a lot like modern dolphins. Ichthyosaurs in the northwestern waters can be found killing and eating wild Kairuku. An Ichthyosaur is a mid-sized marine reptile, taking the rough shape of a dolphin. It has large eyes for spying fish and squid in the dark depths, a long snout for catching said prey, and a large brain that gives the animal its inherently curious nature. This section displays the Ichthyosaurus's natural colors and regions. For demonstration, the regions below are colored red over an albino Ichthyosaurus. The colored squares shown underneath each region's description are the colors that the Ichthyosaurus will randomly spawn with to provide an overall range of its natural color scheme. Hover your cursor over a color to display its name and ID. For example, "cheat SetTargetDinoColor 0 6" would color the Ichthyosaurus's "body" magenta. Using the (PC), (PS4), (Xbox One), the Ichthy bites the target. This section describes how to fight against the Ichthy. The Ichthy will flee once you or your tame attacks it. It's recommend using a fast water mount and chasing it down, which is the most effective and fastest way. The more wasteful and time consuming way is to get a fast flying mount, pick up a friend or tribe mate, and have them get a gun or bow/crossbow and shoot it from above. Any aquatic mount or even just spears can take out an Ichthyosaur. You may also need SCUBA Flippers if you don’t have a mount. While not a dangerous animal itself, the Ichthy can attract dangerous creatures such as Megalodon or Manta. Be prepared to fight more than just an Ichthyosaur if you do go hunting for one. These animals don't have that much health, so killing them isn't that difficult in general. The Ichthy is unable to be tamed through the standard tranquilize-and-feed methods, and must be tamed non-violently. To feed it, place raw meat on the last slot of your hotbar, then when approached press use (default e, , ) to feed it. You cannot feed them all the meat required for taming at one time, you must wait every couple of minutes until it is hungry again to feed it more until its taming meter is filled. The Ichthyosaurus will nuzzle up to tamed creatures, so using them to help tame them is recommended. The Ichthyosaurus may try to swim away while you are taming it. If you find the Icthyosaurus keeps running away you might be able to get between it and the open ocean forcing it to run to the shallows where it could get stuck for you to tame it. Its still likely it may get away though so blocking it in even further might help as well.It is advised not to try and tame them in open water. It will co-habitat with Megalodons and Mantas, which together with the water can make taming them a bit dangerous. Scout: While it initially has a lower sprinting speed than the Plesiosaur and Mosasaurus, it gains the highest absolute Value (135) per Level and can easily grow to be the fastest underwater mount other than the manta. Sprinting may also be maintained due to low Stamina drain (Level Speed and some Stamina). You are also traveling very safe because you are way faster than most creatures. Black Pearl Farmer: It can be used to farm Eurypterids since it is the only mount besides the Angler that has no knockback, which usually has a massive effect on the Eurypterids, and because of that they may be constantly attacked and killed effortlessly by the Ichthy. A big advantage compared to the Angler is that the Ichthy does not gain any torpor, which the Eurypterids can massively inflict (Level Health and Melee Damage). In the dossier there is a picture that presumably depicts the relative size between the Ichthyosaurus and the Megalodon of the island. Disturbingly, there is a much larger creature behind the Megalodon. It might be a Mosasaurus, but the background creature may also be a hint at an underwater boss. 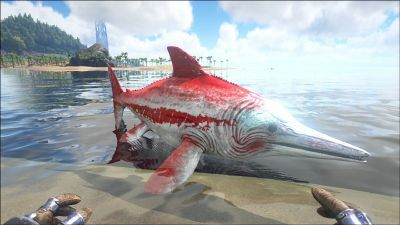 Before patch 183.2, Ichthyosaurs would die if even a fraction of them was above the water. Prior to being added, Ichthyosaurus was referred to in the "upcoming week patch notes" as Shastasaurus. As Ichthys are reptiles, the lack of an oxygen attribute is an error. They are one of the few species in Ark to retain their eating animation after they are tamed. However their eating animation is slightly glitched as their long snouts actually cross each other. Ichthyosaurus are attracted by other tamed Ichthy and Megalodons. 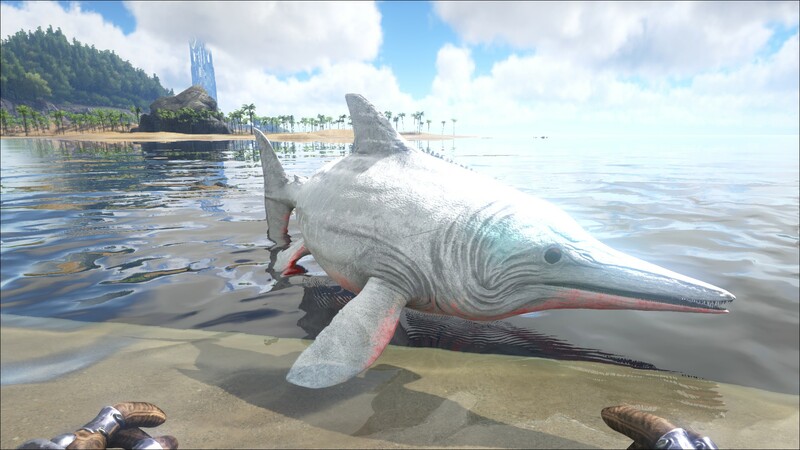 Although being attracted to water pets may be a benefit for players looking to tame one, not moving for even a few moments could attract enough to stop your Plesiosaur or Mosasaurus from moving. Despite the common belief that Icthyosaurus is playful and curious in ARK, they can actually be quite aggressive to wild terrestrial creatures. So long as a player or tamed animal is nowhere in the vicinity, Icthyosaurus are very aggressive, similar to Megalodons, and will attack just about any land animal that gets into the same vicinity of them. Although they can be found in the north killing and eating Kairuku, they often tussle with Carbonemys in warmer waters; they will attack Ankylosaurus, Carnotaurus, Raptors, and even Rexes if there is no player in the immediate vicinity. This is most likely a bug. If you tranq a creature, like a Parasaur, and it slides into the ocean where Ichthys are present, they will attack and eat the drowned creature. This page was last edited on 15 April 2019, at 08:58.